The good news is there is nothing to install or pay for in order to use LinkedIn Contacts. 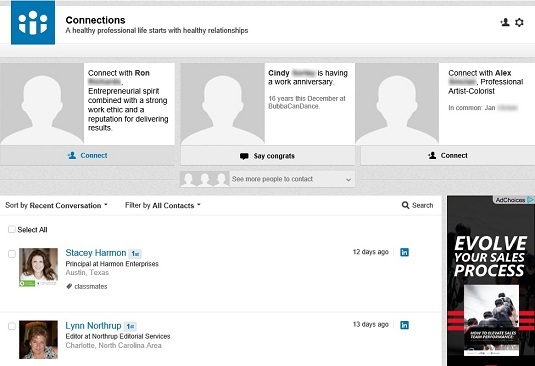 Any LinkedIn member, whether he has a free or paid account, sees the same LinkedIn Contacts screen and has access to all the LinkedIn Contacts functions. This capability is available from the moment you join LinkedIn and start adding connections, and it’s free to sync any of your other accounts to LinkedIn to store additional information. Currently, LinkedIn is able to sync with major e-mail providers such as Gmail, Yahoo! Mail, and Outlook, along with address books like Google Contacts, Yahoo! Address Book, Outlook Address Book, and the iPhone Address Book. In addition, you can sync information with systems such as Evernote and TripIt. To get started, you click the Connections link in the top navigation bar. You should see the Connections screen. Along the top of the screen, LinkedIn displays a tiled bar of contacts who have either reported a new event or potential new contacts of someone in your network. Each element in that bar has a suggested action, such as “Say Congrats” or “Connect,” that you can click, which encourages some interaction with that person. You can also hover your mouse over any of these tiles and click the Skip link at the bottom right of each tile area to bring up another potential contact, or click the See More People to Contact link to bring up another row of contact tiles. LinkedIn Connections keeps you in touch with your network. Below that bar is your list of contacts, sorted by Recent Conversation by default. This way, you see the LinkedIn contacts you’ve most recently talked to, and next to each name, LinkedIn shows the length of time that has passed since your last interaction. Next to the Sort By option is the Filter By option, which is useful if you want to see a certain subset of your contacts list. By default, it’s set to All Contacts, but if you click the down arrow, you can set a filter to see only the list of contacts from a certain Company, Location, Job Title, Source, or self-created Tag, instead of the list of All Contacts. To the right of the Filter By option is a Search link. When you click it, a text box appears that you can use to search your contact list. Simply type the desired first or last name in the box and then press Enter to run the search.